Lip enhancement and augmentation involves the use of dermal fillers to add shape, volume and to contour the lips. By placing small amounts of dermal filler into sections of the lip and surrounding area it is possible to change the shape of the lip, enhance particular areas and improve symmetry. As we age the volume of our lips decreases with a loss of subcutaneous tissue and fat. This loss of volume also results in the appearance of the fine lines and wrinkles around the lips which can make the lips look drawn out and thin. Lip augmentation can help to reverse these tell tale signs of aging as well as augment those without naturally plump lips. Dermal fillers are naturally occurring gel-like substances and are used to soften and fill lines and folds and replace lost volume within the face and lips. Dermal fillers attract and bind with water which gives the appearance even more fullness to the injected area and improves the skin’s hydration. At Youth Lab we will tailor a lip filler treatment program to suit your individual needs, your unique lips and smile whist aiming to maintain symmetry, proportion and a natural result. A full consultation with our doctors is required before treatment to address individual concerns and desired outcome. 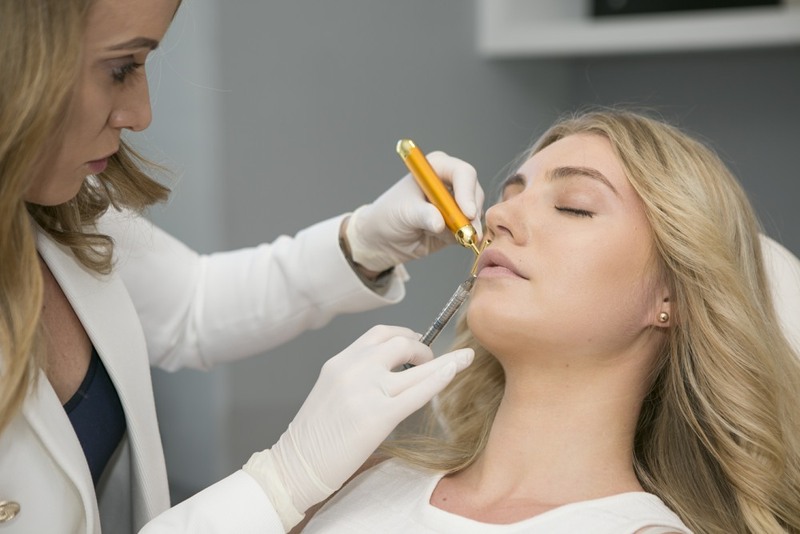 The procedure involves the injection of a small amount of dermal filler into certain areas of the lip depending on the indication for the procedure. Treatment can cause some discomfort and will involve multiple small injections with small amounts of filler injected at a time to ensure a uniform distribution of the filler. This will help to avoid the ‘sausage’ look or ‘trout pout’. The entire procedure takes approximately 30 minutes. Sometimes combination treatment with dermal fillers and wrinkle relaxers can be performed in other areas which will result in a longer treatment time but without any added discomfort. Results are instantaneous, however they are temporary with most cases lasting from 6-12 months depending on the type of dermal filler used (based on the use of 1ml). This will be discussed at length during initial consultation and when deciding on a treatment plan. There is no associated downtime with lip enhancement and patients can return to their normal activities following the treatment. There may be increased swelling to the area for the first 24-48 hours, and swelling and bruising can persist for the first week. Once this settles down the final result is evident. Follow-up in 3-4 weeks following initial treatment is recommended to determine if more filler is required and if the desired outcome has been reached. It may take multiple treatments using multiple syringes of dermal filler to achieve the desired result. Youth Lab specialises in lip enhancement. We use advanced injection techniques and high quality products and aim for patients to walk out of their first treatment with a very natural result. + ARE THERE ANY RISKS WITH LIP ENHANCEMENT (lip fillers)? There are minimal side effects associated with dermal lip fillers and lip enhancement. These may include local swelling, redness and bruising as the lips have a very rich blood supply. Dermal filler injections cannot be given to people who are pregnant or breastfeeding, have taken a course of prescription acne medications in the last 3 months, have a history of autoimmune diseases or multiple allergies. Youth Lab has one of the leading reputations in Perth when it comes to consistently delivering subtle yet striking, natural results for lip enhancements. Our practitioners use the product that is best suited for your lips and will advise the quantity you will need to get the desired result. To view our up to date pricing for all other Dermal Fillers with our Cosmetic Doctors, please visit our Medical Treatment Doctor Pricing page and look up under the Dermal Fillers section. To view our up to date pricing for all other Dermal Fillers with with our Cosmetic Registered Nurses, please visit our Medical Treatment Nurse Pricing page and look up under the Dermal Fillers section.